With the iPhone 2g Steve Jobs created a mobile computing revolution that changed everything. Although mobile art was not started on an iPhone, it certainly exploded there. Digital fingerpainting was born. And our community of finger painters shortly afterwards. 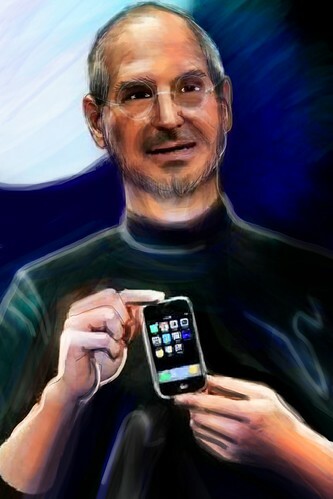 iPhone fingerpainting represented a digital revolution. Artist from around the world creating, sharing. Being inspired. Being foolish. A democratic phenomena spreading art around the world in an un predicated manner. A cafe society on steroids. Mashing art, apps, finding new ways to express. Did Steve imagine all this from the beginning? Perhaps. Perhaps this and more. Or perhaps a true visionary just knows how to mix the cocktails that will please the senses and liberate the mind. Comfortable in the knowlege that it will lead to great things. There will be new and wonderful smartphones and digital devices from apple and it’s competitors. More unbelievable art will be created. Steve showed us the way and will be remembered alongside the greatest minds of history. We fingerpainters are in happily in Steve’s debt. This entry was posted on Thursday, October 6th, 2011 at 09:17. You can follow any responses to this entry through the RSS 2.0 feed. You can leave a response, or trackback from your own site. Steve Jobs, gave us the wheel.